We have definitely had a late summer around here. The tomatoes are finally beginning to ripen and are available at the farmer’s markets. I never thought it would happen. There is nothing better than a fresh, juicy tomato, but when you saute them delicately with some onions and white wine…they become even more magical. Each bite bursts with flavor and becomes a wonderful complement to any meal. 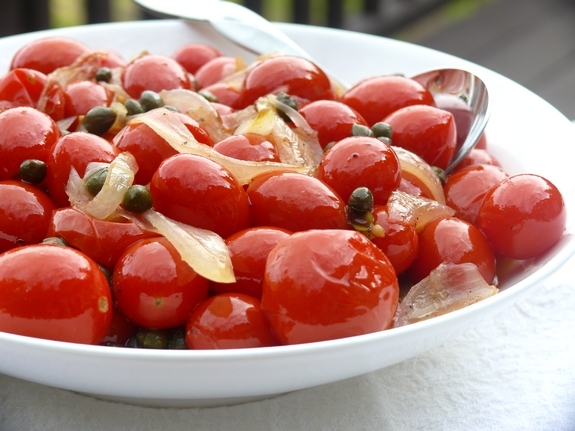 The capers really add a lot to the dish, don’t leave them out! I hope you enjoy these as much as we did, they made us feel like summer is never going to end. Heat your oil in a large skillet over medium-high heat. Add the onions and cook about 5 minutes, or until they are softened and showing a little browning on the edges. Add the tomatoes, 1 teaspoon Kosher salt and 1/2 teaspoon black pepper. Stir the pan until four or five of the tomatoes began to burst open. This could take 3-5 minutes. Add the wine and continue to cook until almost evaporated, another 5 minutes. Stir in the capers. Beautiful photo of those ripe, juicy tomatoes! They would compliment just about any dish. We LOVE tomatoes. Thanks for this idea. 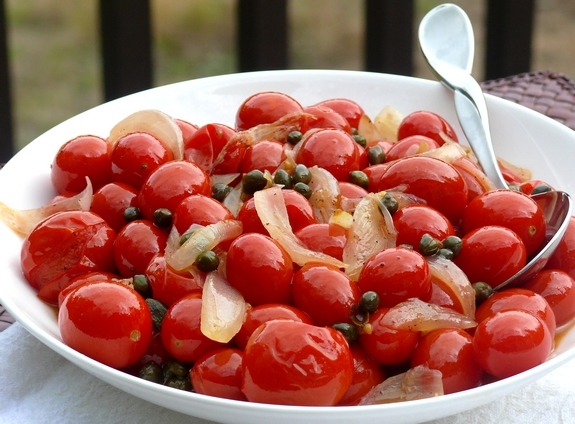 this looks terrific, I love the red tomatoes it is a great appetizer.